Robust, good-performing and affordable over-the-range microwaves are not that easy to find these days. Most models available on the market are too small or too expensive and don’t really do the trick when it comes to preparing proper family meals. Some of us need our microwaves to do a little more than just cook popcorn or reheat yesterday’s pizza. An over-the-range microwave oven we have recently tested, the GE JVM3160RFSS 30″, is a powerful, robust device that won’t burn a hole in your pocket. Below is our unbiased, concise review of this model. This is certainly not a microwave that has a lot of aesthetic value. The overall visual aspect of it is far from thrilling, but the slick stainless steel surface and the simple grey-black color scheme is a guarantee that this model won’t hurt your kitchen’s overall aesthetics. The JVM3160RFSS combines the properties of smaller over-the-range microwave ovens with the performance and durability of conventional microwave models. The control buttons are placed vertically, which isn’t something we often see with over-the-range microwaves. Even though we expected this to be an inconvenience, the designers somehow made it work. The only obvious flaw are the dark buttons that can sometimes be a bit difficult to read. The 1.6 cubic feet capacity is a tad bit underwhelming, but definitely serves the purpose. The venting system removes smoke and steam effectively and works great. Overall, the JVM3160RFSS doesn’t really excel in the design department, but it is well-built, durable and simple. The simple, straightforward design doesn’t really tell the story about performance. Performance is where this model excels. A large number of presets and power levels, combined with the fact that the microwave makes little to no noise while venting, are some of the reasons this is one of the best-selling over-the-range microwaves in America. It is really easy to use, which is certainly another pro. While it is easy to use, the microwave is not that easy to install. Some customers have struggled with the installation process, so it’s probably a good idea to pay close attention to the user manual. That will definitely make installation relatively simple, even for those of you who aren’t too handy. The two-speed, two fan, 300-CFM venting system gets the job done efficiently and quietly, while the on/off turntable function makes preparing elaborate meals easy. Defrosting, reheating, cooking and preparing all kinds of foods is a breeze and the non-sticky interior makes the JVM3160RFSS extremely easy to clean and maintain. The cooking sensor is very accurate and all food comes out of the oven evenly cooked or reheated, without hot/cold spots. The quality of prepared food is, essentially, what it all comes down to and the food cooked in the JVM3160RFSS looks and tastes great. 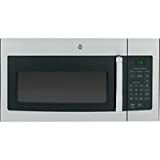 The GE JVM3160RFSS 30″ Over-The-Range Microwave Oven is not a flashy microwave to be occasionally used for popcorn cooking or as a kitchen decoration of sorts. This is a powerful microwave oven that does everything you’d want your microwave to do and more. Whether you’re a college student looking to prepare a quick meal every day, or an experienced family cook who likes filling their family’s bellies with tasty food, this model will get the job done and even over-deliver when it comes to performance.